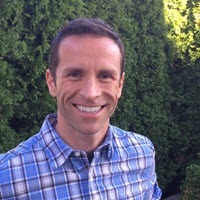 A notorious trait of vSphere Home Labs is that they start out simple and modest, then evolve into something looking like a small Data Center. As the Home Lab grows in size and sophistication, eventually elements such as power, cooling, and noise can become a problem. IT folks are typically technology geeks at heart, so the first logical step at addressing a problem introduced by one technology is to… well, tackle it with another technology. This post isn’t necessarily about my Home Lab, but how I’ve chosen to power my home where the lab runs. That would be by the use of a residential solar system. A few have asked for me to provide some information on the setup, so here it is. My interest in solar goes back as far as I can remember. As a young boy I watched my father build four 4’x8′ panels filled with copper tubing to supplement the natural gas furnace providing hot water. It turns out that wasn’t his first adventure with solar. Growing up in the plains of the Midwest during the heart of the Great Depression in the 1930s, he cobbled together what was a crude sort of solar system so his family could have a hot water to a shower outside. I marveled at his ingenuity. Residential solar systems typically consist of a collection of panels housing Photovoltaic (PV) cells, connected in series, generating DC current. Each panel has a wattage rating. My panels; 20 in total, are made by Itek Energy, and rated at 280 Watts per panel. Multiplied by 20, this gives a potential to generate 5.6kW in direct sunlight, and optimal orientation. Most PV solar is inherently DC, so this needs to be converted to AC via inverter. Converting DC to AC or vice versa usually has some cost on efficiency. Considering that most electronic devices are DC, and have a transformer of their own, this is a humorous reminder that Thomas Edison and Nikola Tesla are still battling it out after all these years. Typically solar panels are mounted on a generally south facing side to collect as much direct sunlight as possible. Ideally, the panels would always be perpendicular to the orientation and angle to the sun. With fixed mounting on a roof, this just isn’t going to happen. But fixed mounting in non-ideal situations can still yield good results. For instance, even though my roof has a far from perfect orientation, the results are impressive. An azimuth of 180 degrees would be true South, and considered ideal in the northern hemisphere. My azimuth is 250 degrees (on a 6:12 pitch roof), meaning that it is facing 70 degrees westward from being ideal. 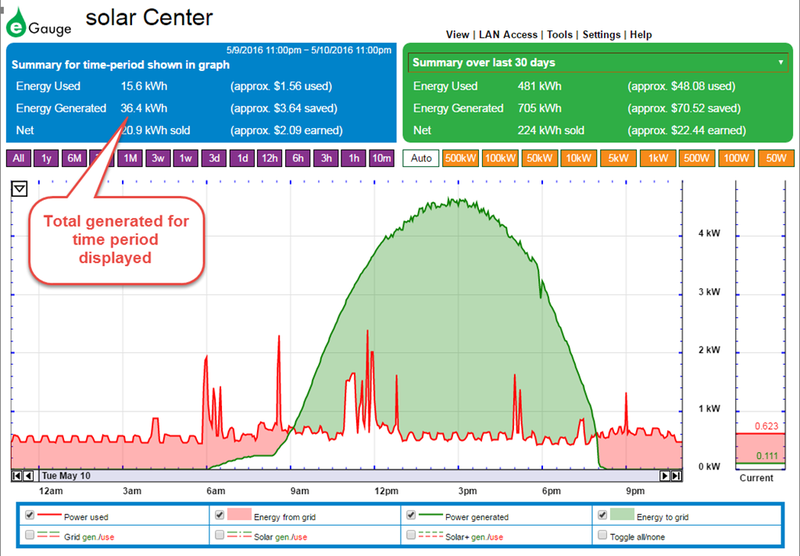 However, my 5.6kW solar system peaks out at around 5.2kW, and catches more afternoon light than morning light, often better in areas that may have morning fog or marine air. This less than perfect orientation is estimated to only have a 10% reduction of the total production output of the panels over the course of a year. The 400 Watt shortage from it’s rated maximum is the result of loss from the inverter transitioning it over to AC, as well as some loss to atmospheric conditions. Sizing of residential solar systems is often the result of the following design requirements and constraints. 1.) How many panels can fit on a roof with ideal orientation. 2.) What is your average electricity usage per day (in kWh), and 3.) What state incentives would make for the ideal size of a system. The good news is that sizing a system, and estimating the capabilities is far more sophisticated than just guesswork. Any qualified installer will be able to run the numbers for your arrangement and give you full ROI estimates. The National Energy Renewable Laboratory (NREL) has a site that allows you to plug in all of your variables, and also factors in local weather data to provide detailed analysis of a proposed environment. Many, if not most residential solar installations these days are grid tied systems. This means that the solar supplements your power from the grid in such a way that the needs of the home will consume the power from the panels, and if there is an overabundance of power generated from the panels, it will feed this back into the grid, and bill your power provider. This is called "net metering" and provides an experience that is seamless to the consumer. One would want to be a bit careful as to not oversize grid tied systems, because some power providers may have caps on net metering and how much they pay you for electricity generated. A residential solar system may also be battery backed. The benefit to this of course would be full independence from getting power from the grid. However, this introduces capital and operational costs not associated with grid tied systems. The system may have to be sized larger to ensure adequate power on those days where the panels don’t have the ability to generate as much electricity as you hoped for. Battery backed systems may or may not be eligible for some of the subsidies in your area. Grid tied systems prevent the need for one to have this infrastructure, and in many ways, can be thought of as the battery backup to your home when your solar power is not generating enough electricity. Thanks to modern technology, monitoring solutions can give you full visibility into the performance of your solar panels. My system uses an eGauge Systems Data logger. Since most of my career in IT has involved interpreting graphs and performance data in an attempt to understand systems better, monitoring the system has been one of the more entertaining aspects of the process. One can easily see via Web interface, how much load is being drawn by activities in your home, and how much power is being generated by the solar. The eGauge solution offers quick and easy access to monitoring of the environment via mobile devices, or web browser. Entering in all of your variables will also help it determine how much money you are saving for any given period of time. 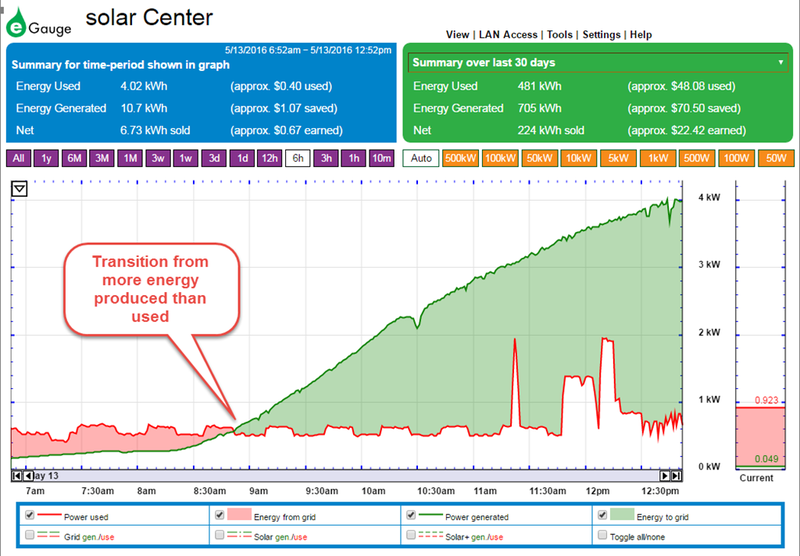 As the image shows below, it is easy to see how much load the home is consuming (the red fill, how much the solar system is generating (green fill), and how it is either offsetting the load, or feeding back power into the grid system. Below is a view of a 6 hour window of time. The data is extremely granular; collected and rendered once per second. In case you are curious, my 6 node vSphere home lab is on 24×7, and consumes between 250 and 300 Watts (6.5kWh per day), so that is some of what contributes to the continuous line of red, even when there isn’t much going on in the house. It is an understatement to say that the economics of residential solar varies widely. Geographic location, roof orientation, roof pitch, surface area, weather patterns, federal incentives, state incentives, and electricity rates all play a part in the equation of economic viability. Let’s not forget that much like recycling, or buying a hybrid vehicle, some people do it for emotional reasons as well. In other words, it might make them feel good, regardless if it is a silly financial decision or not. That is not what was driving me, but it would be naive to overlook that this influences people. Incentives typically fall into three categories. Federal incentives. This currently is a 30% rebate at the end of the year on your up-front cost of the entire system. State Incentives. Some States include some form of a production incentive program. This means that for every kWh of energy produced (whether you use it or not), you may receive a payment for the amount produced. This can be at some pre negotiated rate that is quite lucrative. Production incentives in the State of Washington can go as high as 54 cents per kWh, but may have limited terms. State incentives also may include waiving sales tax on all equipment produced in the state. Power provider incentives. This comes in the form of Net metering, and simply charge the power company for every kWh that you produce, but do not use. This is often at a rate equal to what they charge you for power. (e.g. 10 cents per kWh). Realistically, the State and power provider incentives are heavily tied to each other, as power companies are a heavily regulated State entity. Usually it is the State incentives or high power rates in a State are what make solar economically viable. These incentives can make an investment like this have a break-even period that is very reasonable. If there are no State incentives, and you have dirt cheap power from the grid, then it becomes a much tougher sell. This is often where battery backed systems with cheaper Chinese manufactured panels come into play. It is a rapidly changing industry, and depends heavily on legislation in each State. Is solar right for you? It depends on many of the conditions stated above. It’s really best to check with a local installer who can help you determine if it is or not. I used Northwest Wind & Solar to help work through that process, as well as installation of the system. The actual performance of solar varies widely. Diffused sunlight, or just daylight will certainly generate power, but it may be only 10 % to 20% of potential of the panel. This is one of the reason why power generated can fluctuate so widely. Solar requires a lot of surface area. This was no surprise to me because of my past experience buying small, deck of card sized panels from Radio Shack in my youth. Each of my 20, Itek panels measure out at 3’x5′ per panel and produce 280W in theoretically ideal conditions. Depending on your average daily consumption of energy, you might need between 15 and 40 panels just to accommodate energy utilization rates. Because of this need for a large surface area, incorporating solar into objects such as vehicles is gimmickry at best (yes, I’m talking to you Toyota) and plays into emotions more than it does providing any practical benefit. Monitoring of your power is pretty powerful. Aside from the cool factor of the software that allows you to see how much energy is generated, you also quickly see the realities of some items in your household. Filling a house full of LEDs might reduce your energy consumption and make you feel good along the way, but a few extra loads in of laundry in the dryer, or a bit trigger happy with the A/C unit in your home will quickly offset those savings. Often a crystal clear sunny day does not yield the highest wattage of power generation. The highest peak output comes on partly sunny days. I suspect the reason is that there is less interference in the atmosphere in those partly sunny days. 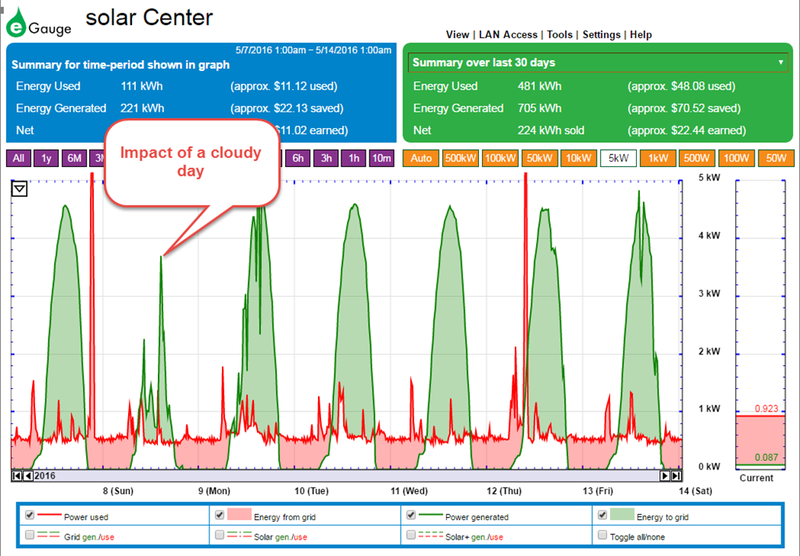 For me, those partly sunny days that may peak the power generation of my system at 5.25kW, will often be only about 4.6kW at its highest on what would be thought of as a crystal clear blue sky day. Determining whether or not to invest in residential solar is really no different than making a smart design decision in the Data Center. Use data, and not emotions to drive the decision making, then follow that up with real data analysis to determine its success. This approach helps avoid the "trust us, it’s great!" approach found all too often in the IT industry and beyond. What does your infrastructure analytics really tell you? Iometer. As good as you want to make it.